This cemetery is one of several Hixson Cemeteries in this area. 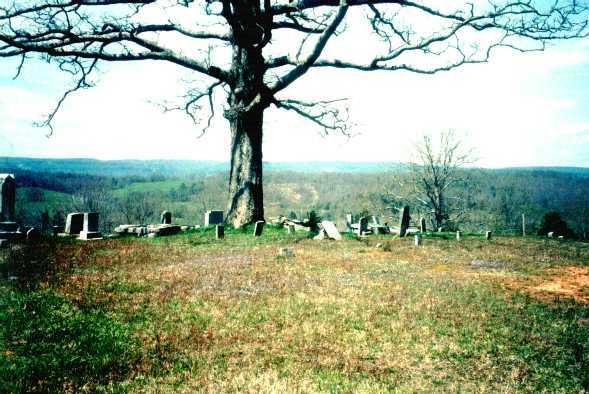 This Hixson Cemetery is located about 5 miles north of Dunlap and about 8 miles south of Pikeville on East Valley Road, very close to the Sequatchie and Bledsoe County line. Travelling north on East Valley Road, Hixson Cemetery is 2.3 miles north of US Highway 111, on the right. It is situated on a hill that overlooks the Sequatchie Valley at the front and the Cumberlain Mountains, Walden's Ridge, to the back. Hixson Cemetery seems to have about 15 unmarked graves and 83 marked graves that have markers but are so old and weathered they are no longer legible. These unmarked graves and weathered markers are mostly located in the oldest part of the cemetery which is at the back and very top of the hill. There are also 6 cript tombs that are about 12 inches high and made of mountain stone with a large slab of rock on top. Growing out of the foot of one cript is a very large, old oak tree and the cript has become a pile of broken rocks. FRAZIER, WILLIAM FRANCIS b. May 8, 1881, d. May 1, 1926 h/o EMMA ELLA TOMPKINS F.
McWILLIAMS, EASTER, b. September 7, 1837, d. Feb. 10, 1865. The following aditional information was supplied by a relation: Easter McWilliams' maiden name was Graham. She was the daughter of John Graham and Elizabeth Sawyer. She was also the wife of David McWilliams who is buried at the McWilliams Cemetery. After her death, David McWilliams married her sister Caroline Graham. Caroline Graham McWilliams is buried at the Hixson Cemetery on the hill, not too far from the crypt where the remains of the headstone of her sister Easter lies. The pieces of this broken headstone have been placed on the crypt. It is thought that the stone was originally next to her sister Caroline. NARRAMORE, OSCAR LAYFETTE b. Nov. 23, 1902, d. April 9, 1985 h/o BESSIE L. GRAHAM N.